Experiencing disturbing episodes of d�j�-vu, eleven year old Tom believes he is going mad. Then, he meets the adventurer Septimus Mason, who shows him that he is a �Walker� � someone who can transport himself to other times and places. In dreams, Tom has experienced life as other �Walkers� in times of mortal danger: Edward Dyson killed at the Battle of Isandlwana, 1879; Mary Brown who perished in the Great Fire of London, 1666; and finally Charlie Hawker, a sailor who was drowned on a U-boat in 1943. Reluctantly agreeing to travel back in time and rescue them, Tom has three dangerous adventures before returning to the present day. Tom�s troubles have only just started, however, for he has now drawn the attention of powerful individuals who seek to use him to change history and to bend it to their will. This leads to a struggle wherein Tom�s family are obliterated from existence and Tom must make a choice between saving them and saving his entire world. Tomorrow's Guardian is a great Young Reader Science Fiction story about a time travel agency that protects the world from people who would use time travel to alter history for their own benefit. I really enjoyed this first book in the Hourglass Institute series and cannot wait to find out what happens next in Yesterday's Treasures. Tomorrow's Guardian was a fun read filled with so many twists, that you'll be guessing until the very end. Denning created a clever world where time is fragile and every event matters. He interweaves time-travel and history in a way that makes history exciting. I loved quirky cast of characters from different periods of time. Together, they made me laugh as they travel through time to keep the world safe from people who want to try to change history for their own gain. I would recommend this to parents and young adult readers. It is an interesting and speculative look at time travel in a bit of a different light. It is adventurous as well as fun. The characters are interesting and the story will resonate with the young at heart. This would be a great addition to your child’s library. I would recommend this book to anyone who wants to feel young at heart again or the high school and middle aged group. Keep up the good work. Fans of scifi, action packed YA will enjoy this book for sure. It's fun, exciting, thrilling, and an all around great read. A new twist on time travel you have to read to believe! I think young readers would absolutely love Tomorrows Guardian, it’s fast paced, action packed and has history splashed throughout its pages. I recommend this book to people who are looking for an action packed historical thrill ride. Tense and gripping stuff – Tomorrow’s Guardian is a classic time jumping yarn that mixes high adventure, historical fact with a nail-biting finale. This book will be fantastic for pre and early teen readers that love action adventure with a dash of history and mystery. I would recommend this book to people who are around Tom’s age (11-12) as I feel that they would enjoy the book much better, but I believe that this book is suitable for all ages due to the historical element and the excitement that grips you to the book. Richard has written a great story, and I look forward to new adventures with Tom Oakley. 'Richard Denning, ... keeps the action fast and furious for the 400 or so pages of the book. 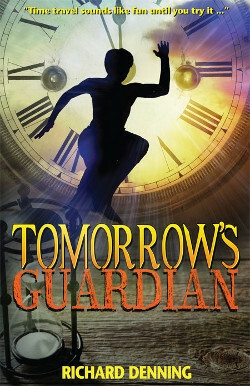 I enjoyed reading 'Tomorrow's Guardian' by Richard Denning. It has a good mix of adventure, history, and comradery and should catch the eye of the pickiest readers-- young, pre-teen boys-- while still being a fun read for other sci-fi buffs. One of the most important and good things about this book was how well described everything was. Like in fantasies, it is crucial you describe the world well. This book had many, and it really helped my enjoyment of the book, I could really imagine what places they arrived at, and it made it really fun to read! I would recommend this book to any person above 10 years, as it is enjoyable for all ages. Teens will love this book because they can relate to Tom who is approximately their age. He is very believable. Since Tom is from another country, the reader has a chance to travel to another place. With Tom's time traveling, the reader gets taken to a different time too. I really enjoyed reading Tomorrow's Guardian. Richard Denning put a lot of ideas and problems into the book, but the combination worked well and made sense. His descriptions were good, not too general but without the fluff you sometimes encounter. His characters were also very believable. Mary, the Walker rescued in the Great Fire of London, was one of my favorite characters because it made sense that she would be scared and worried at her sudden time change. Her worries and failure to call Tom anything but "Master" were details that made her very real to me. Overall, I think the book was well written, with a believable plot and characters. The book made good use of history, fiction, and science, and I would definitely recommend this to anyone who likes science fiction books, adventure, or an enjoyable read. I recieved Tomorrows Guardian on Thursday and my youngest James (10) and I are reading it together. It's causing bedtime issues in that he wants to read more than time allows.